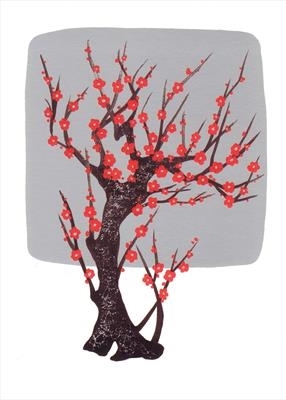 The second of a pair of red and silver images inspired by Chinese and Japanese paintings of trees. The silver colour has a beautiful sheen, which I have found difficult to show in a photograph. Each card is a little smaller than 5" x 7". These cards are litho printed onto 350gsm trucard with a silk finish. They are blank inside for your own message, and each come individually wrapped in cellophane together with a silver envelope. Free postage to UK addresses. For multiple orders, contact me (price reductions for larger numbers).